Q: My name is Sarah and I am a graduate student who is slowly becoming a fairly competent sewing who is entranced by all thing vintage/retro. I have been following your blog for some time (great inspirations!) so I thought you might be the person to which I could bring this sort of question. I am trying to figure out how to recreate this dress that Haley Atwell's character wore in the recent film Captain America (unfortunately the pictures I can gather from the Internet don't due justice to how stunning it appears on screen). 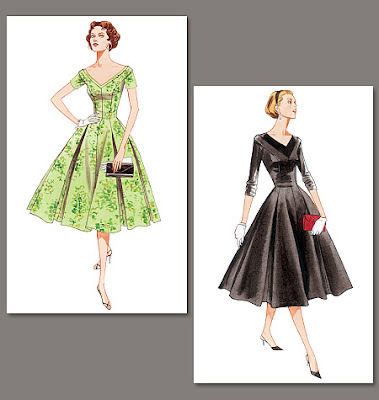 I have looked around for some patterns (vintage and modern) which have the same general features, ie. 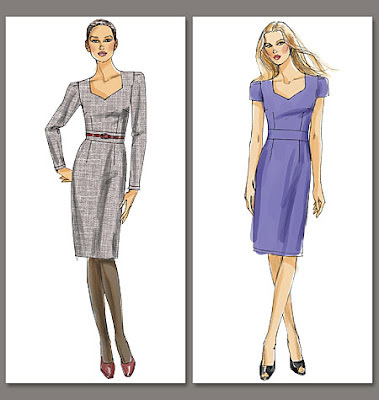 v-neck, belted, fitted pencil (kind of wiggle-like) skirt and long sleeves (with perhaps a little puff, I can't quite tell), but I just can't seem to find any that capture the same spirit. Any ideas? Have you run across anything that seems similar or know where I could go to do some further investigating? Any advice would be appreciated. Thanks for your help and for all the great inspiration! Great question, and beautiful dress! I can’t find any patterns for something exactly like it, but there are definitely some vintage-inspired Vogue patterns that would give you the look. 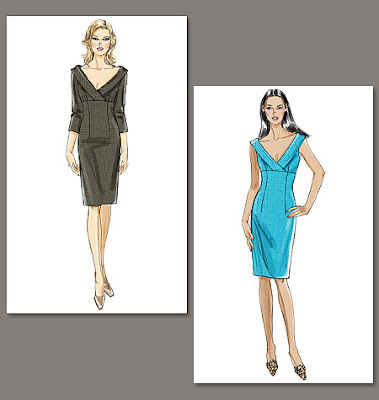 When I look to copy something with a modern pattern, I look for the way the dress is constructed—that one has a v-neck darted bodice, pencil skirt, and puffed ¾ sleeves (you’ve got it in your descriotion!). And a collar overlay that I can’t quite figure out. So, with those items in mind, you can combine patterns to copy it as closely as possible, or you can just use a very similar pattern and it’ll be cute although not an exact replica. BY FAR the closest. Gather instead of dart the sleeves, and you can reshape the neckline to a true V. You might want to leave off the waistband and instead just make the bodice a little longer, like the original, or just cover it with a belt like she has. Hope one of those strikes your fancy, Sarah! Hope I’ve been somewhat helpful. Good luck recreating that beautiful dress! That first one definitely looks the closest to me! Lately I've had my eye on another vogue pattern (here: http://voguepatterns.mccall.com/v8766-products-15146.php?page_id=855) which I think could also be modified to look more like this dress. If you buy any patterns from this site, though, sign up for their newsletter and wait....the one I've got my eye on goes on sale every 2-3 weeks for really cheap (along with most of the other patterns...to less than $4 if I recall) and you get a lot of bang for your buck. I just love that first pattern--I recommended it in this Sewing Circle: http://www.adventuresindressmaking.com/2011/11/asos-dress-diy-sewing-circle-reader.html. I guess the V-piece could be treated like a collar, and just added in between the right side and wrong side. You could free-form it, actually, using the bodice pattern as a base and drawing a V-shape about 1.5" wide, plus seam allowances.